This post examines a particularly horrendous violation of children’s rights: the phenomenon of child soldiers. The footage of the massacre of prisoners in Saraqi is evidence not just of a war crime but also of the use of a child soldier by the Syrian rebels. 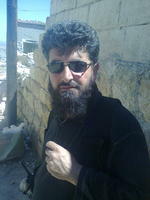 He was used in the assault on the army checkpoint and was at the massacre scene. There is no doubt that this represents serious child abuse. 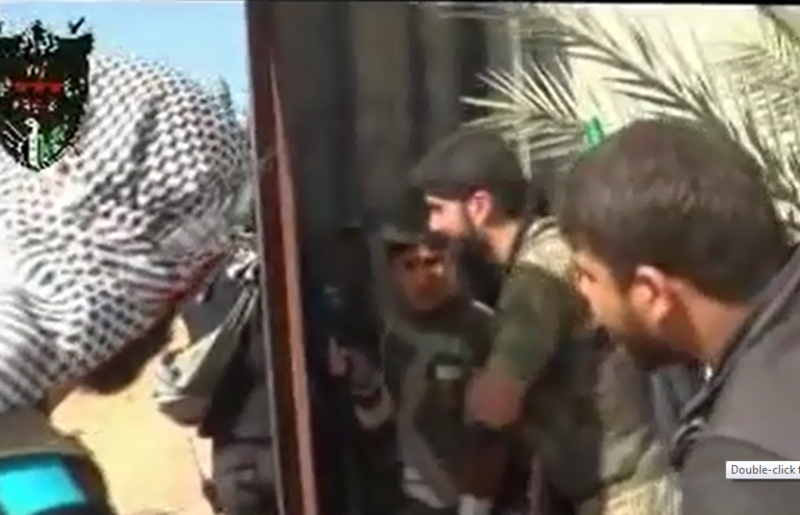 Human Rights Investigations (HRI) has obtained video footage of the assault on the army checkpoint and the massacre of prisoners in Saraqib – footage including the rebel use of a tank, the battle, the slaughter of prisoners and the dead bodies. We have been able to confirm the exact location where this battle occurred. As a group of rebels make their way towards the battle it is clear that amongst them is a young boy with them who is carrying a gun. As the rebels attack the checkpoint through an orchard it is clear that the boy is with them as the battle rages and gunfire is all around. After the checkpoint is captured and in the place where the prisoners are slaughtered the footage catches the boy as he moves across the field of vision and a child’s voice can be clearly heard. The use by the rebels of a child soldier in this battle is itself a crime and it is difficult to imagine the emotional, physical, developmental, social and spiritual harm done through exposure to such war crimes. Why are the Syrian rebels using child soldiers? The provision of inexpensive, lightweight weapons to the rebels has made it easier to use children as soldiers. These small arms are lethal and relatively easy to use with little training. There is no doubt that countries including Turkey, Qatar and Saudi Arabia are providing weapons to the rebels. One of the groups involved in this incident has been directly supported by high-up figures such Emad Ad-Din Al-Rashid who has been raising funds in Washington DC. Ahmed Abu Issa, commander of the “Sham Falcons Brigade” and the “Syrian Liberation Front.” He approves the killing of prisoners, uses child soldiers and even uses captives as unwilling suicide bombers. Children are also more impressionable and vulnerable to indoctrination, they learn skills and tasks quickly, are fast and agile on a battlefield, more willing than adults to take risks and are seen as more loyal and less threatening to adult leadership. In Syria, the economy is being destroyed through sanctions and war and children are used as cheap and expendable labour; they require less food and no payment. In addition, using child soldiers can present a dilemma to enemies: should they kill children? As a general rule, child soldiers are separated from their families, forced to flee their homes and schools, and in many cases, killed, maimed, sexually abused or otherwise exploited. This has a devastating impact on their physical and mental wellbeing for the rest of their lives. They are usually forced to live under harsh conditions with insufficient food and little or no access to healthcare or education. They are almost always treated brutally, subjected to beatings and humiliating treatment. Punishments for mistakes or desertion are often very severe. They are forced to engage in hazardous activities such as laying and clearing mines or explosives, using weapons, playing the role of spies, bomb carriers, sentries and human shields. In some instances the commanders approach the children directly and use scare tactics or entice them with money. They may also glorify freedom fighters, use gifts such as bicycles or false promises of overseas scholarships to bring the child under the control of the armed group, leaving the parents without any say. In this instance it seems likely the child has been told that killing the enemy is part of the Jihad, and if they die in the effort they will go to heaven. As much as we should all work to dissuade rebel forces from using children, the only certain way of preventing the recruitment of children is to stop the civil war from continuing – which means to stop using Syria and its children as geo-political pawns, to stop fuelling the conflict and to engage in serious peace talks immediately. If you would like to help end the use of child soldiers in Syria please use Facebook and Twitter to share this post. Have you considered that we just might be seeing the boy’s only living relative placing him behind a shelter and telling him to stay there, before they start the shooting? Boy looks annoyed enough for this alternate explanation. 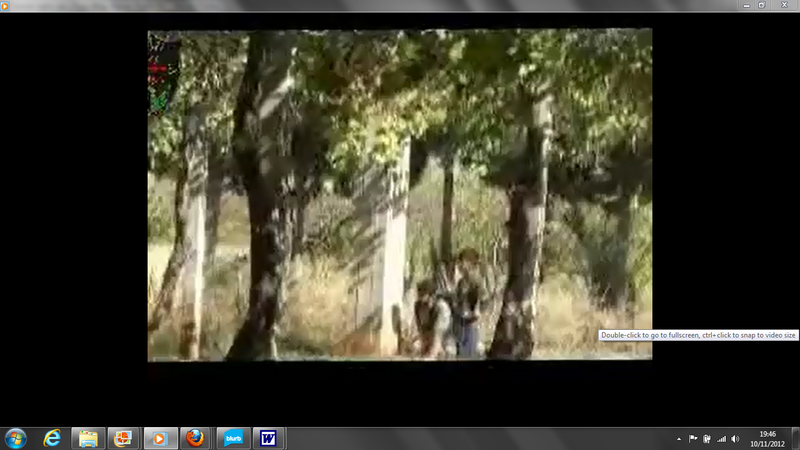 Hi Penny – no they take the boy out of that relatively safe place down into the orchard as they attack the checkpoint. The brigades in this area control a number of villages and their soldiers don’t need to take their dependents into action with them. Well i suppose at a stretch you could tell yourself rubbish like that…. for god sake the kid has a rifle in his hand…just naivety or lookin for any excuse. one boy they enticed into combat now has no hands and is blind in one eye. seriously im gettin so annoyed with people, the country is in turmoil at the hands of i have no clue what they are…humans certainly not!